What does the future hold for our smartphones? Well according to chip maker Qualcomm the sky's the limit as manufacturers succumb to consumer's greed for bigger, better, more fantastical tech in their pocket. TechRadar spoke to Michelle Leyden Li, Qualcomm's Senior Director of Marketing, about the developing technologies in the mobile field. "Consumers never seem to be satisfied and people want more and more things on their devices," Li explained. "People are using their phones more for movies, TV, video... it's their own personal device and they want a beautiful experience." It's this impossible dream of true satisfaction which is pushing manufacturers to develop 2K, and ultimately 4K displays for our smartphones. We've already seen the first 2K toting smartphone sneak out in China in the form of the Vivo Xplay3S and there's a lot of talk surrounding 4K screens arriving on handsets as soon as 2014. With 4K comes a couple of obvious questions: do we need it, and isn't it going to kill battery life? Li doesn't seem to be concerned. "The industry always seems to solve issues. The 4K screens will require a lot of power, but the industry always seems to rise to the challenge." With higher resolution screens comes the need for better batteries to ensure you still get a full days use from your smartphone on a single charge, and Li says it's one of Qualcomm's top priorities. "Battery life is key. It's all about low power now and it's critical you keep processors as low powered as possible. Consumers don't want to trade off performance for better battery life - they want the best of both worlds. "Everyone has a different day of usage and we're really focused on delivering the full feature set to customers." While Apple is lauding the 64-bit chip in the iPhone 5S, iPad Air and iPad mini 2, Qualcomm isn't getting too carried away with the PC level processor just yet. "We're always looking at what's going on in the industry, and the timings of launches and adoption," Li explained. "Currently we're happy with our roadmap and the Snapdragon 800 chip." That chip can be found in the likes of the Galaxy Note 3, LG G2 and Xperia Z Ultra, and although Qualcomm is staying coy on 64-bit involvement you get the feeling it will enter the arena at some point in the not too distance future. Li also noted that the firm's 800 processor currently provides support for up to 55MP cameras as well as a software suit including HDR, object removal and zero shutter lag. "The smartphone camera is huge," Li told us. "People always want to have great pictures and don't want to carry camera as well as phone." Considering no phone is currently pushing Qualcomm's chip to its full camera potential, it raises the question what the next generation of SoCs (system on chip) will offer us. 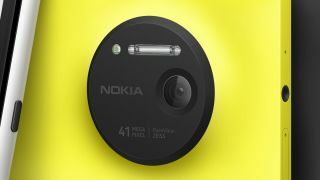 The Nokia Lumia 1020 with its 41MP snapper suddenly doesn't seem so impressive now.